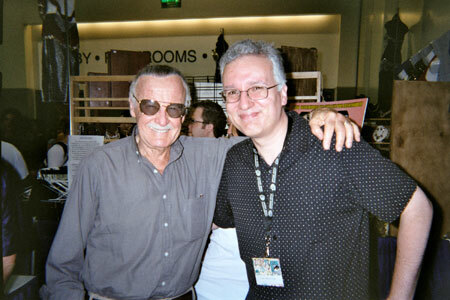 The venerable and totally Marvelous Mr. Stan Lee (left) seen here at a recent convention appearance with unidentified onlooker. Y'see, after turning me on to the Carmine Infantino tome a few weeks back, friend Rocco's enthusiastic recommendation then pointed me in the direction of "Excelsior! The Amazing Life of Stan Lee" by Stan Lee (natch!) and George Mair, the Marvel legend's recently released autobiography. In point of fact, Rocco was nudged into purchasing said saga by our mutual pal--and everyone's favorite inker--Terry Austin, so ultimately it's Mr. A I have to thank for getting me to put my nose firmly in this book. Oh sure, I'd bought a copy when it came out--how could I not?--but frankly, the odds of it making it onto my "must read" list anytime soon seemed slim at best. After all, I've been with Stan pretty much since the beginning of the halcyon Marvel Age he helped usher in. I've read all the comics, all the Soapboxes, all the interviews, all the reprint collection introductions--virtually everything the Man has written or said for the record in the last forty years, and inasmuch as no one would ever accuse him of being shy, what new information could I POSSIBLY glean from what I fully expected to be a hastily cobbled together conglomeration of Stan's greatest--and most familiar--anecdotes? Well, as it turns out, true believers, a whole heckuva lot!! Far from focusing solely on his triumphs post-FANTASTIC FOUR #1 to the exclusion of most everything else, our intrepid journalist doesn't even REACH that watershed event in his recounting until, amazingly, page 111 in this too-slim-leaves-you-begging-for-more-246-total-pages-volume! And while pages 111 on have their rewards, it's those first 110 that I found so disarmingly endearing. Yes, I said "endearing"--you just TRY reading this book and NOT come away eminently charmed by it's subject/author!?! Yeah, it's no secret that I've been entranced by Stan's peppy patter almost from the outset, which for me would've been the fourth ground-breaking issue of FANTASTIC FOUR. No denying the stories themselves were intriguing, while the Kirby (or Ditko) art was fresh and dynamic, but what REALLY hooked me was Stan's unique editorial presence. For a complete neophyte,I somehow glommed onto these lettercol voices early on, and by late 1962, there were three outstandingly individual ones to my mind: the Superman Family's Mort Weisinger, DC Comics Silver Age architect Julie Schwartz, and the guru of the yet-to-be-christened-Marvel Comics, Stan Lee. And then along came Stan. Out went the heretofore standard "Dear Editor" jazz, in came "Dear Stan and (important point here) Jack" in it's stead. Whining over perceived slights were nowhere to be found, replaced instead by the admission that there are, even in the world of comic books, room for differing viewpoints, even--gasp!--admissions of erring from on high! And maybe most importantly, there was a playful, fun, two-way communication between readers and creators that had never been seen before (at least by me--no need to write, EC fans). Yeah, the guys putting these funnybooks together were all adults, but they were the sort of adults kids wouldn't mind actually spending some time with, not merely hope to escape from! Plunk down 12 cents in 1963 for the Marvel mag of your choice--or better yet, buy 'em ALL! !--and you'd not only get a way cool story, some amazingly thrilling artwork, but more than a few uplifting and encouraging words from every ten year olds favorite fortysomething, good ol' Stan!! Oh, I realize it developed into some sort of a shtick as the years wore on and success bred still more success, but it truly was startlingly original in the beginning. Sorta like, as much as I admire and appreciate their more sophisticated "White Album" and "Abbey Road" periods, it's the "She Loves You" and "I Want To Hold Your Hand" era that'll always instantly bring a smile to my face when I think back on that OTHER fantastic foursome, the Beatles. And it's the same way with Stan's evolving presence in Marvel Comics. Nothing tops those intimate "Special Announcements" sections that he included in the 1963 FF and Spidey lettercols. As the firm expanded, the comics checklists became, by necessity, more packaged, appearing in the same guise all across the line. But by golly, I'm here to confess, at age ten, I pretty much lived merely to soak up whatever information Stan chose to pepper those nascent communiques with!! And in his book--hey,remember the book?--Stan admits that the whole thing was carefully planned on his part! He tried to get chummy with us youngsters because he realized that by gaining our loyalties, he'd also gain our business! Now, you might wonder, does that somehow disappoint me to learn, after all these many years, that buddying up to me and my pint-sized peers was but a calculated move on the part of our beloved Stan? No! And I'll tell you why: while he may've been employing tricks picked up from the advertising trade, he was still, when you came right down to it, being himself. If you're trying to project being lovable, it helps immeasurably if you actually ARE lovable in your day-to-day persona. Hey, you don't think Weisinger was trying to chummy on up to us kids, hoping to finesse us out of our pennies? You bet he was--and you can also bet we kids could spot his basic insincerity a mile away. In his case, it was far more creepy than chummy. Stan, of course, was just doing his job, trying to sell comic books for Martin Goodman, sure, BUT his enthusiasm seemed then--and still does now--wholeheartedly sincere. That's not to say he couldn't lapse into a veritable mode of self-parodying hype from time to time, especially as the years wore on, but I'm convinced that, at the base of it all, lies a genuine honesty. Take a look at all the myriad interviews with some of comicdom's elder workforce appearing yonder and non, and listen to what they all, pretty much to a man (and the occasional woman) say about the celebrated Mr. Lee--he was fun, he was enthusiastic, and back in the forties and fifties, he didn't screw freelancer's anywhere near what was the industry's then norm!?! That's gotta tell you SOMETHING!?! About the only fella I can recall having any negative issues with Stan was the late Wally Wood. Despite possessing obviously monumental talent, other more lamentable aspects of Mr. Wood's life might lead one to believe that he may not've been the best judge of character. Certainly, I never met the man, so this is all speculation on my part, but perhaps, in the final estimation, Stan's appearance on Wally's infamous little @#$% list should be discounted, agreed? The Timely days. Simon and Kirby. And distant relative/boss Martin Goodman. They're all here. And the many references to Goodman are eyeopening, especially to those critics who latched on to charges of nepotism in their misguided efforts to diminish Stan's achievements. Nice guy though he may be, he still doesn't have a whole lot positive to say about his erstwhile employer's business acumen. Of course, we're only privy to one side of the story here, but Stan's perspective is illuminating nonetheless. No, controversy isn't ducked by any means within "Excelsior! "'s pages, but neither is it thrust front and center. Long running differences between both Lee and Kirby and Lee and Ditko regarding the dicey issue of creator credits are handled deftly, and in a manner meant not to shortchange in any way two of his greatest collaborators, while still declaring, hey, I had something important to do with cooking up these characters, too, y'know! (Fact is, Stan seems to shy away from the subject of long-time favorite but clear-cut Kirby Kreation, the Silver Surfer, so as to not open up THAT can of worms, while Captain America is identified early on as springing solely from the S&K stable, with little follow up information given regarding his sixties revival) And then there's a whole chapter dealing with that Internet site fiasco that had his name attached to it from just a few years back (Did you know I worked on that ill-fated project, too, though my efforts never quite made it online? Yup! Well, another time for THAT story!...). Stan sheepishly spends most of the chapter castigating himself for his stupidity and his trusting nature. It's almost as excruciating as when Stan relates being ushered in and out of the executive suites in recent years as the seemingly revolving door of top Marvel brass changed with dizzying regularity, as the very man who was responsible for putting these fat cats in their luxuriously upholstered chairs in the first place still felt some need to curry favor with them. But it's really not all that much of a stretch for our Mr. Lee--clearly, Stan is a people person, and always has been. Since most--if not all--of these bloated bigwigs were people, it works out. Mostly. Look, the man charmed me when I was but a lad of ten, and he can certainly charm these overpaid knuckleheads now, believe you me! And I say, great--more power to him!! Obviously, his wife of long-standing (and, no doubt, more than occasional sitting), Joan wasn't immune to those potent charms of his (Stan's latent mutant abilities, don'tcha know?..). An awful lot of the text is devoted to the missus--as well as to daughter Joanie--and while I know some comics fans might prefer long asides concerning exactly which size pen nib Don Heck used while inking Iron Man, I find it refreshing that Stan gives that much ink to the two people who--despite the readers undying love for the original cast of Marvel Bullpenners--are undoubtedly the most important folks in his life! Too often, I find that you come across bios where the author says, almost as an aside, "Then I met Matilda, we got married, and two years later, the twins, Harry and Lucy, arrived. Now, back to ME..." That's not the way things happened in Stan Lee's life, as he clearly didn't live it in a vacuum. But worry not--even if you're not a huge fan of hopelessly happy marriages, everything is dealt with so briskly and with such breezily good humor, even the hardest-hearted reader amongst you wouldn't suffer overmuch from the tales of the Lee's blissful union! Then there's the saga of circumstances surrounding the birth of SGT FURY AND HIS HOWLING COMMANDOS. Goodman contended the surprising success of the early Marvel books had a great deal to do with their strong titles, while Stan (rightly) argued for their fresh approach to story and art. Finally, to prove himself right and his boss wrong, he claims he purposely came up with as lousy a title as any this side of BROTHER POWER, THE GEEK--the aforementioned Sarge and charges, of course-- then made it a war book to boot, but bestowed upon it the freshly hatched Marvel Style so as to see exactly what it was that propelled the new line of books on and then rapidly off the newsstands. And yup, it sold, dumb title and all!! Now, this one I believe--up to a point. I seem to recall Stan making fun of the title pretty much from the book's launch, with his main selling point being his promise that it'd be told in the now popular Marvel Style!! Still, I doubt Goodman issued a book with a deliberately lame title just to prove a point. Who knows the real story for sure, but my guess would be that Merry Martin saddled Stan with the title AND the unpopular war genre, seeing if Stan could rise to the challenge of making it a success. Which he did, but clearly by utilizing his new-fangled way, not the way they used to do it in the Atlas Comics of the fifties. Or somesuch. It's a minor point, but one that stuck in my proverbial craw, and after all the sickeningly sweet plaudits I've showered Stan with, I wanted to prove to you, my faithful readers, that yes, when necessary, I CAN be tough!! Grrr, y'all!